Thanks for all the birthday wishes, guys! We even got some new fanart. (Go take a look!) You guys rock! I felt surrounded by love all weekend and I am grateful. In my 23rd year of existence, I’ll be out of college and it’s up to me to make and direct myself. I want to improve as an artist and a person as much as I can. Thanks for coming along for the ride! Your titles sure get funny. Poooooor poor Skearva. Poooooooooor Skearva. I guess he’s still too shocked to get mad. Lol Ecta’s enjoying herself. And seeing Floyd always makes me smile for some reason. Must be the shirt. You’re doing a fantastic job with the backgrounds. I like how you texture walls and floors and thing now so it’s not just a flat bg color. And I’m glad to hear it about the backgrounds, too… I still hate being in the castle though, the CEASELESS DULL OVERBEARING MONOTONY OF IT… hm. That was a quote from the play I was in but it just kind of came out. I really am curious what brush you use for those walls; I want indoor effects like that when I rekick back up my webcomic. I’m indoor too much also. I would love you forever for that brush list, lol. I’m afraid to call it; what if I get charged long distance to Taiwan? XD But now I’m curious . . .
Ecta is gleeful. It’s freaky. Floyd’s line was the best, hands down. Happy Belated Birthday Courtney!! I don’t know why I didn’t just say that in the last strip; Now I feel dumb. Not saying anything AND not donating… >< Still hope it was a good one, and much love as always! But Flyod wins everything in this strip. YAY FLOYD. Oh, did you not? It’s not like I’m keeping a checklist of who wished me happy birthday and who didn’t. XD But thank you! I have no idea why, but I think those backgrounds look really good. Really, it’s probably the contrast with Cyril’s face though. Yeah. She’s mouth-above-eye smug. That’s how smug. Skaerva’s trying to be angry, but he is just too upset. At least he didn’t blow Davis up like The Wizard did. Yeah, he’s a good person to work under, he really is. As good as villains get, I suppose… since the Third died, anyway. Happy Belated Birthday from me too! At least I got you on time on your Deviantart page, lol. I’ve got a present for you, but it’s late because I fell sick too. XD Oh Irony, you . . . 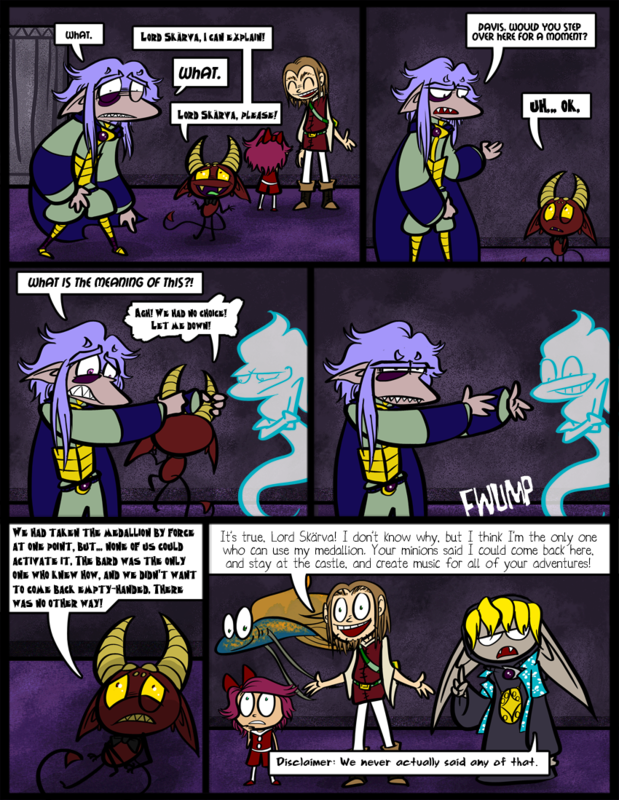 I like how Skaerva’s more freaked out than mad. I guess spending hours in that barrel with that bard had the effect of scarring him for life, lol. And I LIKE happy Ecta; she’s funny. XD And Floyd wins “Best Expression” for this strip. “Dforted retaken” . . . is Captcha trying to say “The fort is retaken” with a lisp? Whoops, Happy belated B-day! Sorry it’s late. Hope you felt better for your big day. Green links. You have a thing for green, I’m guessing. I love how you got Davis’ eyes to look a bit glassy, if that isn’t just the was it usually is. Does it hurt to be picked up by the horns like that? Davis should go to HR and say something about that. Green’s pretty cool! I guess it’s my third favorite color after yellow and then purple. Put them all together for instant Mardi Gras! I started putting little shines on all their eyes a while back. It’s just most obvious with his. I don’t think it actually hurts. He’s more just panicked at being off the ground so suddenly. Now, if you picked him up by the ears… that’s something Ecta can keep in mind. OOH! Something that’s been poking at me for a while now; do you have any sort of headcanon for how everyone’s voices sound? I don’t know why, but it’s been bothering me lately. Haha, other people have asked this, and my answer is always the same. I’m really bad at imagining voices! Me and Victor don’t care, really, so it’s up to you. The most I can say is that each character’s font is supposed to be their “voice” and was chosen to fit each personality, but also suggest something about their manner of speaking. So characters who speak in all caps (Like Skaerva and Davis) I imagine are more gruff and snarly… Blank and Cyril both have kind of dorky fonts, almost Comic Sans, so I imagine they are nasally and annoying… Slice is very bubbly… they are just meant to be vague suggestions! Oh! Also, a while back, completely out of the blue, I had a dream that there was a cartoon based on The Fourth airing on Cartoon Network. It was pretty epic, and a shame it was just a dream. Agh I’ve had daydreams like that. I just would really love to see these guys animated someday. Might have to learn how to do it myself. Happy belated birthday! Where the hell was I? He’s not… I mean… well, maybe. I dunno. Also, here’s a (Copy, Pastes) Link to a forum that’s turned into an RPG! Ooh, those guys are really getting into it! I was once involved in something similar. Wonderful times. Don’t really have time for it anymore, I’m afraid! I now know -TWO- characters in awesome webcomics that have such dramatically chromatic appendages! I LOVE TONGUES. I dunno if drawing has helped me appreciate things more, but I’m totally apt to be working on something and suddenly be overcome with love and fascination for hands, ears, eyebrows, whatever. But as a linguistics major I especially love tongues. The human tongue is AMAZING and it does so much for us. It is rather useful! Tasting is fun! HURRAH! Happy Birthday, and don’t let the horns get ya either! You know, I didn’t notice before, but Floyd looks amazing with that medallion! New touch to his already awesome sense of fashion, anyone? Also, captcha asks: ToAst religion)? Toast religion? Like “Cheers! To religion! *clink*” Or like, worshipping toast? I would prefer a bagel religion. Thank you Floyd for being the voice of reason in the last panel. I’m sure Skarva appreciates that.